After graduating from the U.S. Naval Academy, Junior League of Schenectady and Saratoga Counties member Sarah Stotz spent time on the U.S.S. Enterprise, the U.S.S. O’Brien, and at the Pentagon. 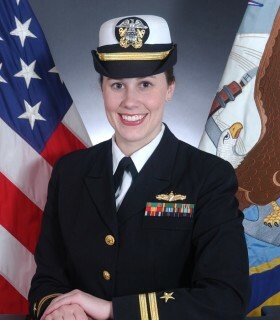 As a Nuclear Surface Warfare Officer she led nuclear mechanics in the operations of a propulsion plant comprised of turbines, pumps, compressors, and valves, and, as an Information Systems Officer, she commanded technicians in the maintenance of communications equipment, navigation, and ship operations. Currently she develops licensing partnerships for GE that result in new uses for its technology around the world.